For all of the bullying talk from Merkel, Verhofstadt and Juncker post PM Theresa May’s Article 50 letter the harsh realities of writing a doctrine in such a cocksured way based on the assumption no one would leave is ironic to say the least. Although age was a factor to sleep deprivation among firefighters, there should be no shame in suffering from it. I feel for those that put their lives on the line for others. It is a shame that the person in question had to plunge to such shallow waters to avoid being hosed by the boss. He has ended up being a victim of his own backdraft. Customer service! What is it? How well do we know our customers? In my case it is a Mr Kamimura, a diligent garçon at Aux Bacchanales in Kioi-cho, Tokyo. No matter what mood you’re in he has an innate ability to make you forget and laugh at yourself. In my case today new shoes are causing blisters. He saw me with bandaids at hand. Sensing what was wrong he scribed “blister” in my latte. A small thing perhaps but isn’t it amazing how something so simple, not discovered in any manual can keep a customer coming. The coffee is pretty good too so it’s a win-win. I’m fascinated how in today’s smartphone gazing culture how as humans were actually missing out what really matters. “You stink!” How the EU could learn from the same denial as musicians and journalists. “We miss you already.” Those words spoken by President of the European Council Donald Tusk ring deeper than mere sentiment. As much as the almost year long debate of preventing the triggering of Article 50, PM Theresa May has respected democracy. Whether the musings of Sir Bob Geldof, the legal challenges led by Gina Miller or paying attention to polls that showed some wanted to change their original Brexit decision, the UK is doing the right thing. If it is any consolation one can only hope that the EU understands that it is the problem. Was the EU such a no brainer club to be a part of the UK would happily stayed by the campfire singing kumbaya. Did the EU forget the Swiss recently handed back their decades long free pass to enter the EU? I’ve worked in several organizations where management was in denial. I’m sure many of you have too. When faced with crisis, some managers choose to point to external factors rather than a lousy product offering that no longer matches the needs of the firm’s clients. It is no different in the world of music or journalism. Journalism is also guilty of denial. The internet has allowed readers to discriminate what they read. Is it any wonder that NYTimes “60% off limited time offer” continues on and that The Guardian has passed around the Guide Dog collection box to keep its product alive, ignoring the fact that it is the ‘poor content’ which attracts users unwilling to pay. Yes, The Guardian is now a charity. To turn the argument on its head, for all of the hatred hurled at Fox News, more people pay for it’s content than CNN and MSNBC combined. Put simply, if people value content they will pay for it. So to the EU, it is time to realize your product stinks. You can’t forever snub your member states with the same old mentality and expect to thrive. Europe has had a checkered history, Cross a border and the language, culture, cuisine and way of life are vastly different, To try to tell these same people they are “one” is utter insanity. To preach ‘diversity’ is irrelevant. Diversity is about respecting difference yet the ideology essentially preaches there Should be none. Yet the EU is the very antithesis of equality. The EU is happy to sit by and bury Greece’s chance of recovery by imposing hardships until they cede their democracy to Brussels and accept a protectorate status, The founder of ‘democracy’ is forced at gunpoint to hand it over when it was indeed the EU that used Goldman Sachs to fiddle its finances to create cooked books that would allow entry. To threaten Austria that if it democratically elected a right wing President that the EU would remove voting rights. That Italians voted on a referendum as a way to oust a pro-EU prime minister rather than the actual question on the ballot paper. That for all the celebrations and clinking of crystal champagne flutes from the German Foreign Ministry at the Dutch election result failed to realize conservative parties trounced the left. The idea that Wilders was going to PM was never going to happen. Yet he won more seats. Rutte only managed to stem his losses by adopting Wilders-lite. The reality of Brexit is now formal. It finally seals a promise. It is a message from Brits who have saved Europe countless times that they cannot be part of a group that won’t listen. That individual mistakes like Merkel’s open borders should be a German problem. Why should Hungarians, Brits or French be forced to take a share of the burden of a mistake made by one individual member state? If the EU had voted to do it in a democratic fashion one might have had some sympathy but this was a mistake and it is unfathomable that the EU seeks to appease Merkel for imposing misguided altruism on countries that don’t share her view. It is this type of action that seals the EU’s fate. The idea of one Europe is fantastic. The practical realities are anything but. President Tusk perhaps said more about the introspection that is well overdue in the hallways of Brussels. Let’s be clear President Tusk, the British do not miss you. M5S has overtaken the ruling Democratic Party (PD) in the most recent poll. An EMG poll shows Beppo Grillo’s party taking 30% of the popular vote, with PD on 27%. M5S is a Eurosceptic party. An interesting blog from 5-Star Movement’s (M5S) head Beppo Grillo. He has been convicted himself so can’t run for parliament but he gels with many Italians for his insults and barbs of incumbent politicians. To understand the M5S is to know that none if its members can be current/former career politicians. This blog sort of speaks volumes as to why the NO vote won today. “Sicily is on the verge of being without water. A state of emergency has been declared in Messina. 259,000 people are without running water. In Gela, they just get water once a week. In Agrigento the provision of water has been suspended because of the presence of bacteria. Water in Sicily is managed (if you can say it’s managed at all) by a private firm (Siciliacque, 59.6% of which is owned by the French firm, Veolia) to whom Cuffaro gave the job of managing it for 40 years. The wishes of the citizens expressed in a referendum on the management of water, were completely ignored. There was a similar situation in Campania, where nine towns were without water yesterday. We have to return to the public management of water. The leaking network needs to be brought back to a good state with investment from the public purse and the risk of hydrological disturbances has to be eliminated as these disturbances are destroying the reservoirs. This is what Italy needs, but instead we are now being taken for a ride with the umpteenth announcement from someone who seems less like a statesman and more like the comic character lngegner Cane from the Gialappas, talking about the construction of the bridge over the Straits of Messina. He followed up this blog which threw stones at convicted politicians still siphoning off the public purse. We’ve had enough! Clean up Parliament! Members of Parliament cannot represent citizens if they’ve been convicted by the courts. And if the law allows it, the law needs to be changed. The thousands of citizens that subscribed to Beppe Grillo’s appeal on his blog http://www.beppegrillo.it and ask that those convicted of a crime should not represent citizens in any Parliament any more, starting from the European Parliament. It’s profoundly immoral that they are allowed to represent us. The guilty sentence that was given by the Genoa court to Alfredo Biondi was taken away on 28 September 2001 because the crime was abrogated. Three new entries in Clean Up Parliament. I know. I know. I’ve cottoned on late. A few of you have already given me the information. But it’s difficult to stay on top of all this coming and going of convicts in Parliament. Now we’ve arrived at twenty. The judicial route to politics. That’s what we’ve got to. To delinquents who make laws after having violated them. Well then, I’m saying this softly softly to these twenty people: GETOUTOFOURHAIR! – Borghezio Mario (euro parliamentarian Lega Nord): convicted of setting fire with aggravating circumstances as an act of discrimination for having set fire to mattresses of some immigrants from outside Europe who were sleeping under a bridge in Turin. He was sentenced to 2 months and 20 days in prison but this was changed to a fine of 3,040 Euro. – De Angelis Marcello (senator AN): convicted and sentenced to 5 years in prison for being in an armed band and for subversive association as an important member of the neofascist group, Terza Posizione. – D’Elia Sergio (member of the Lower House, Rosa nel Pugno): convicted and sentenced to 25 years for being in an armed band and for collaborating in homicide. He was a leader of Prima Linea and participated in the planning of the assault on the Florentine prison delle Murate. On 20 January 1978, it was attacked and one of the prison officers, Fausto Dionisi, was killed. As soon as he was elected as a member of the Lower House, he was nominated by the Unione as Secretary of the Lower House. It is so easy to see Beppo Grillo’s appeal to the Italians. M5S is pointing out the obvious blindness displayed by the incumbent politicians and his broom across the Italian flag shows exactly why the EU should be worried. The Italians care less and less about the Eurozone. They are next in line to be treated like the Greeks. If Mr Schauble gets his wish for the Greeks to leave the Eurozone then don’t expect the Italians to pick up the mantra as whipping boy of the EU. They’ll happily express vafunculo and a word of warning to the EU – they’ll mean every bit of it. The pension problem that many in the US face is no laughing matter. ‘Tis but a scratch is how many (especially state run) pension funds continue to view their predicament outwardly. Internally they must be panicking. Actuarial accounting is a wonderful thing. Tweak a few assumptions and immediately wash away a deep deficit. To put this in perspective the California Public Employee Retirement System (CalPERS) lost around 2% of its funds in 2015/16. The fund assumes an aggressive 7.5% return. Dr. Joe Nation of Stanford Institute for Economic Policy Research thinks unfunded liabilities have surged to $150bn from $93bn in the last two years. Furthermore suggesting the use of a more realistic 4% rate of return. CalPERS has an unfunded liability of $412bn (or the equivalent of 3 years’ worth of state revenue). California collects $138bn in taxes annually in a $2.3 trillion economy (around the size of Italy). With over-inflated asset markets and increasingly negative returns on highly rated paper, the growth in unfunded liabilities is even more concerning as any market correction (likely to be severe given such blatant manipulation to date). If the correction is huge it will push the unfunded portion to even more dizzying levels. According to a Bureau of Labor Statistics report from 2015, the average household income of someone older than age 75 is $34,097 and their average expenses are around $34,382. Despite such austerity, a pension collapse would literally kill off the ability to live a bare bones existence. Years of poor investments have stuffed South Carolina’s government pension plans with a massive funding gap. The plans serve about 550,000 (11%) of residents, and the shortfall of $24.1 billion is more than 3x Palmetto State’s annual budget. Rewind to 2008. The municipality of Vallejo, California filed for bankruptcy. It wasn’t just the evil bankers that caused financial markets to collapse resulting in tax revenues shrivelling. Sadly, the city of Vallejo was living high on the hog. Bloated pensions and fat cat salaries for public servants ruled by stubborn unions created a scenario where it could not bail water fast enough when the crash hit. The police captain was paid over US$300,000 while his lieutenants were on c.US$250,000. The average fire fighter took home US$170,000. The police and firefighters pay and conditions sucked up three-quarters of the budget much more than the 55-60% of most municipalities. That $80mn budget suddenly faced a $17mn black hole. The city was forced to fire 40% of its 260 police officers and told its residents to be judicious with calling 911. Crime rates soared above the state average. Vallejo did not sort its pension obligations to CalPERS during its bankruptcy negotiations which ended up becoming its largest budget hole by a considerable margin. Even in 2011 when the city came out of bankruptcy the pension time bomb ticked away. Moreover, the declaration of bankruptcy prevented access to bond financing making budget gap filling even more complicated. Fast forward to 2016, the anaemic (and slowing) economic growth around the world is putting stress on pension funds ability to payout retirees and fund future pensions. Pension funds set “return targets” which actuaries calculate to ensure the fund stays solvent. However, pension funds need to be diversified with a mixture of cash, bonds and equities. With equities reaching more outlandish valuations and bonds moving further into negative yield territory (capital appreciating at least) pension fund returns are undershooting. When pension funds undershoot then the unfunded liabilities keep growing. As more baby boomers retire the more outflows are putting more pressure on the unfunded portions. San Bernardino, California also filed for bankruptcy after GFC carrying $140mn in unfunded pension liabilities including $50mn in debt it had to raise to fill the pension hole. Yes! It was borrowing money to plug a pension hole. Sort of like buying groceries on the credit card you can’t pay off. Take Detroit, Michigan. It declared bankruptcy around this time three years ago. Its pension and healthcare obligations total north of US$10bn or 4x its annual budget. Accumulated deficits are 7x larger than collections. Dr. Wayne Winegarden of George Mason University wrote that in 2011 half of those occupying the city’s 305,000 properties didn’t pay tax. Almost 80,000 were unoccupied meaning no revenue in the door. Over the three years post the GFC Detroit’s population plunged from 1.8mn to 700,000 putting even more pressure on the shrinking tax base. Scroll forward to 2013 and this is how it looks. 2017 would look even more terrible. Do people then rely on Social Security? Well, according to the 2016 Social Security Trustees report it shows at the current rate the Social Security’s combined retirement and disability trust funds will be empty by 2034. The trustees estimate that the 75-year shortfall is $11.4 trillion in NPV terms. Good luck filling that. 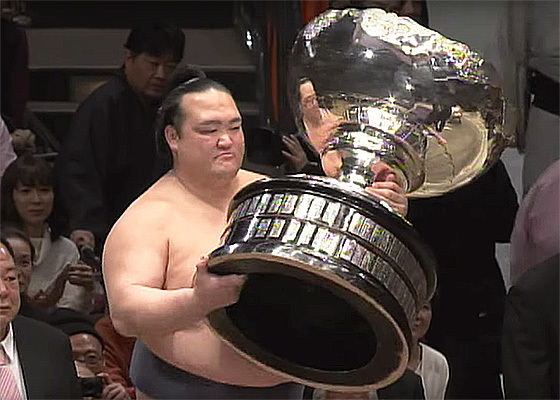 New Japanese Yokozuna (Grand Champion) Kisenosato has won back to back tournaments and his first in the top rank. Despite suffering a severe shoulder injury earlier in the tournament he fought on to win the lot, including the tie breaker. The Mongolian wrestlers have had a strangle hold on Sumo’s top rank for almost two decades since the Japanese yokozuna brothers Takanohana and Wakanohana retired. It is nice to see the pride Japanese have in reclaiming the title of a national sport. At 188cm and 176kg he is by no means the largest wrestler but he showed big heart yesterday.